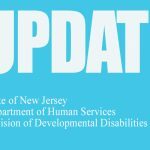 The New Jersey Department of Human Services has announced plans to pay February’s SNAP benefits early amid the government shutdown. Approximately 730,000 people in our state depend on this critical assistance, so we appreciate any help in getting the word out. The state of New Jersey has produced this flyer, which includes updated information. 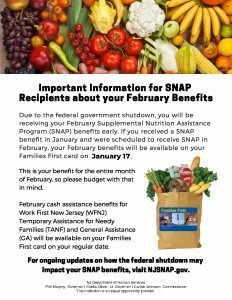 As it stands now, the February SNAP benefits should be paid on Thursday, January 17. It is important that families know these are the February benefits and they should budget with that in mind. At this time, we have no assurances that any additional funding will be available ‎for March. For more information visit the DHS website, or see our press release here.